It's the most wonderful time of the year! I love everything about the holidays. 25 days of Christmas movies on T.V. i.e. A Charlie Brown Christmas, enjoying all the wonderful houses decorated with lights, all the goodies to share at work and with the neighbors and don't forget the reason for the season! 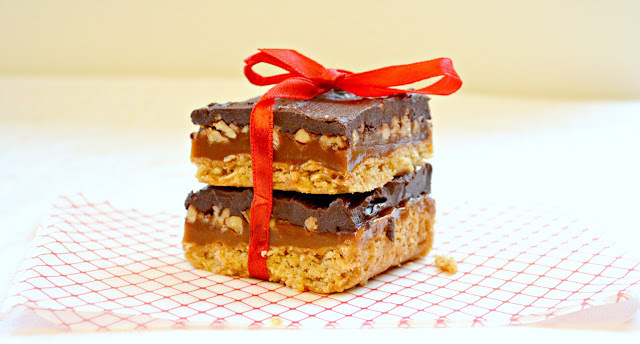 I thought I would kick off the month with Oatmeal Turtle Bars. Chewy oatmeal crust topped with gooey caramel, nuts and then a layer of chocolate. Heavenly I proclaim! Heavenly! Now please step away from the screen to avoid being caught licking it, your family members might think you've finally lost it! No go head to the nearest kitchen to get your Oatmeal Turtle Bars baking! Preheat oven to 350 degrees. Grease a 9"x 13" pan with butter, line with parchment paper and butter parchment paper. In a large mixing bowl combine Flour, Quick Oats, Brown Sugar, Baking Soda, Sea Salt and Softened Butter. Mix on medium speed until fully combined. Place oatmeal crust into pan. Using hand press oatmeal crust evenly around pan and all the way to the edge. Place in preheat oven and bake for 12-15 minutes or until crust is light brown. Measure 1 1/4 cup Chopped Pecans. Mmmm... The house should be starting to smell yummy! In a large saucepan add 1 1/2 cups Sugar, 1/4 cup Corn Syrup and 1/4 cup Water. Attach a candy thermometer and cook over medium-high heat until sugar mixture becomes a caramel color being careful not to burn sugar. In a small saucepan combine 1 cup Cream, 4 tablespoon Butter, 3/4 teaspoon Sea Salt and 1 teaspoon Vanilla. Heat until butter is melted and turn off heat. If you have a little sugar island in the center of pan or the sugar around the edges are browning before the center, gentle swirl to mix with melted sugar. DO NOT STIR SUGAR OR SUGAR CRYSTALS MIGHT FORM. Slowly stir in cream mixture will bubble up while cream is added. Be careful not to add to fast or mixture might boil over. The temprature on the thermometer will drop after cream is added. Continue to boil over medium-high heat until caramel reaches 248 degrees firm ball stage. Spread caramel over oatmeal crust and top with chopped pecans. Allow to cool for 30 minutes. Meanwhile in a medium saucepan add 1/2 cup cream and heat until hot over medium heat. Add chocolate chips and remove from heat. Stir until melted. Add a generous pinch of sea salt. Top pecans with chocolate and allow to sit at room temperature for 2-4 hours or until chocolate is set. Remove from pan and cut into bars. Store in an airtight container at room temperature or in the refrigerator and remove 1 hour before serving so caramel can soften. Enjoy and share with your most favorite loved ones! Oatmeal Turtle Bars recipe. Oatmeal crust, caramel filling with pecans and topped with chocolate from Serena Bakes Simply From Scratch. Mix all ingredients for Oatmeal Crust in a large mixing bowl on medium speed until thoroughly combined. Press Oatmeal crust evenly into pan. Bake for 12-15 minutes or until light brown. In a small saucepan combine cream, butter, sea salt, and vanilla. Heat over medium heat until butter is melted. Meanwhile in a large saucepan combine sugar, corn syrup, and water. Attach a candy thermometer to the side of saucepan, and bring to a boil over medium-high heat, until sugar becomes caramel color. Do not stir sugar, swirl the pan gently as needed to evenly heat sugar, and mix. Once sugar becomes a caramel color slowly stir in warmed cream, being careful not to add to fast as mixture might boil over. Continue to boil until caramel reaches 248 degrees on candy thermometer about 8 minutes. Spread caramel evenly over oatmeal crust, and top with chopped pecans. Allow to cool for 30 minutes. Heat cream over medium heat just until hot. Do not boil. Remove cream from heat. Add chocolate, and sea salt. Stir until chocolate is melted. Spread chocolate evenly over caramel, and pecans. Allow to sit at room temperature for 2-4 hours or until chocolate is set. Remove from pan, and cut into bars. Store in an airtight container at room temperature, or in the refrigerator, and remove 1 hour before serving, so caramel can soften. This is going on my holiday baking list...they look delicious! December is a month to be jolly..love the holiday and festive air around it. Your bars looks so tempting. Mmm, these are fantastic! These would be perfect to give as gifts (and of course sneak a few for yourself!)! These look scrumptious, Serena! Love holiday baking! 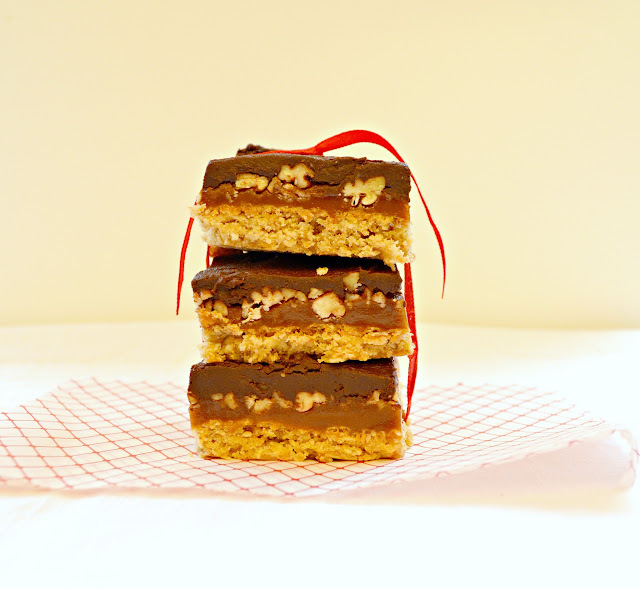 This is yummy bars, I need to kick start my baking adventure. This is my kind of yummy! Hope all is well with you! My husband would go crazy for these - definitely hitting the spot! This would be perfect for snacking on...mmm...want one now! Thanks for the post Serena, will definitely update you with how it goes! Mmmm....these will surely be on my list of " what to bake"